This customer called Alexander Heating and Air Conditioning for air conditioning service near Raleigh North Carolina. His air conditioner had a leak and was not cooling his home. The Goodman Heat Pump had enough R22 in the system to maintain pressures but was not enough to get to the design superheat level necessary to cool the home. 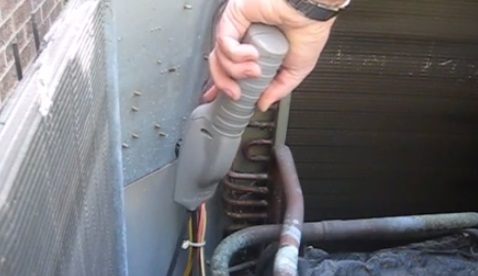 Electronic leak detectors can sniff out even the smallest levels of refrigerant, especially R22, so that it alarms the user when it is near or smells the refrigerant. There are two sensitivity settings on the leak detector, high and low. The high sensitivity can direct the user to the approximate area of the leak and the low sensitivity can narrow that location down even further. The final step is to use a soap-like liquid, much like the bubble toys kids receive in their Easter basket, to pin point the exact leak location. Many times the leaks are so small that very tiny bubbles will form at the leak site. Other times leaks are so large that you can hear the leak and the velocity of the leak just blows the soap off the sight without making any bubbles. In this case the leak was minor. call Alexander Heating and Air Conditioning today.